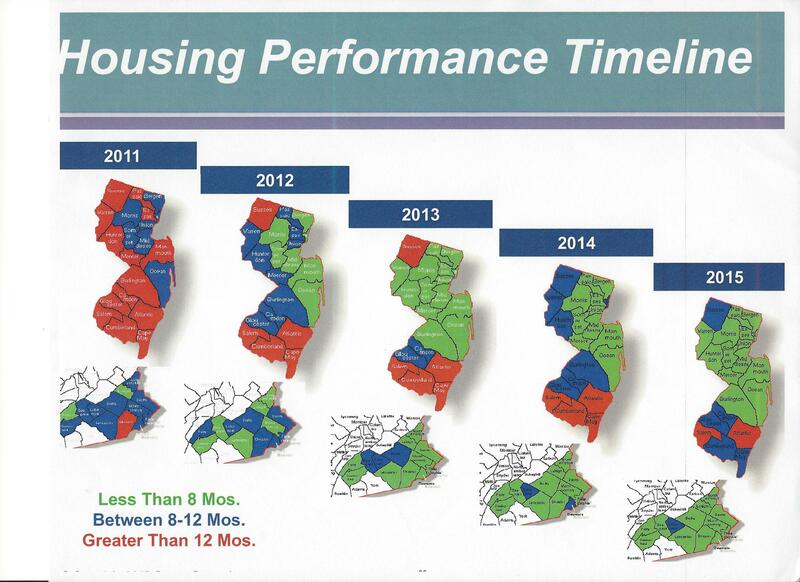 New Jersey Housing Forecast – Out of the Woods – but Into the Weeds? On October 22nd I attended the Fall Housing Trends Workshop presented by Jeffrey Otteau, president of the Otteau Valuation Group, Inc. I always enjoy attending Mr. Otteau’s workshops because his evaluations and predictions related to the northern New Jersey housing market are well thought out, well presented and always backed up by impressive research. This current workshop was no exception. 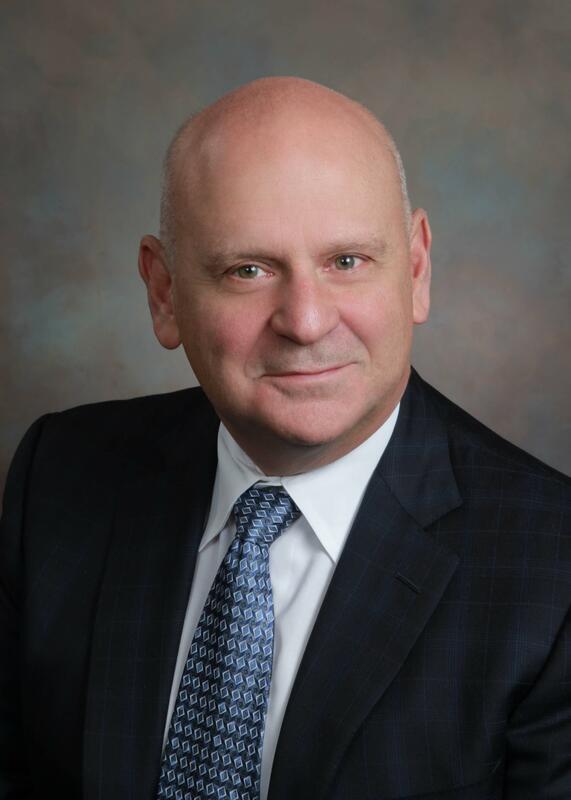 I was keen to hear Mr. Otteau’s thoughts on our current New Jersey housing market to see if my perceptions of 2015 were correct and to hear his forecast for 2016. I am using a few of the graphics Mr. Otteau used in his presentation with his company’s permission. All materials are copyrighted by The Otteau Valuation Group, Inc. Click on the graphics to obtain a larger image. Mr. Otteau began his presentation by saying that 2015 is on pace to be the best year for New Jersey home sales since 2005, and would be the 2nd best year ever. 2005 was the last year when housing was untouched by the correction in prices which was followed by the Great Recession. All is not rosy for all of New Jersey. On average, statewide, housing prices are 16% lower vs. 2005. While the so-called “transit villages”, towns with rail service to NYC, have fully recovered (Montclair and Glen Ridge are examples), the state’s housing has not recovered price-wise from the recession. When it’s said that 2015 is on pace to be the best year since 2005 it refers to numbers of sales, not price. Price trends are different for different price categories, the weakest being the $2 million plus category where there is no transit to NYC. The average home price appreciation in New Jersey is 3% per year but different parts of the state will perform both above and below that average. New Jersey’s economy is last in the nation in terms of recovery. 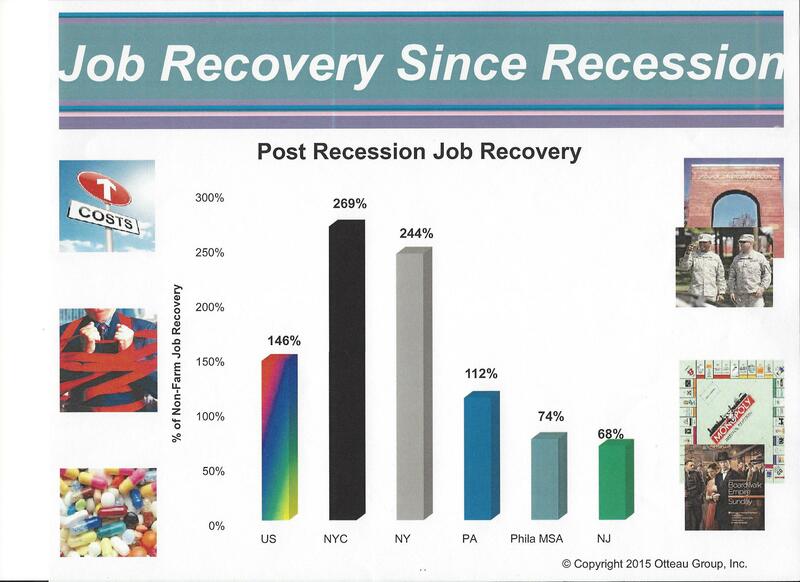 The following chart shows the post recession job recovery for the US, NYC, NY, PA, Philadelphia and NJ. New Jersey has the weakest percentage of jobs recovered since the recession and has had 4 years of declining job creation. It’s no surprise that household income in New Jersey is down. What’s notable is that it’s down by 18%, as compared to a reduction of 5% nationwide. New Jersey has the greatest nationwide decrease in household income. In 2006 New Jersey households had the highest income in the US.now we’re 9th in the nation. Also, jobs being created today are not the same quality as years ago. Even in health care, the fastest rising job market, the jobs being created are not high paying jobs. New Jersey keeps losing the highest paying white-collar jobs. The current glut in vacant office space in New Jersey is testament to that trend. Mr. Otteau contends this has nothing to do with the recession, politics or which political party is in office. He maintains this is due to the flight of jobs to cheaper, offshore markets in the global economy and technology whose sole purpose is to put people out of work. As a result, Mr. Otteau’s conclusion is that we have an economy that can’t provide the same level of opportunity as the past. It follows, naturally, that home ownership will suffer as a result. 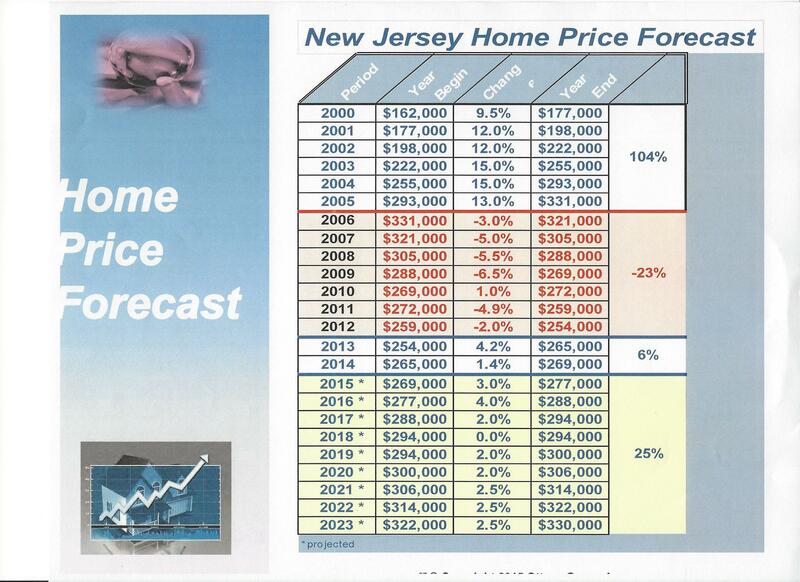 In light of these factors, the average drop of 16% in home prices in New Jersey since 2005 makes sense. Home ownership has declined in New Jersey by 12% since 2005. Nationwide it’s 8%, Many factors come in to play on this statistic, not the least of which are jobs, changed household demographics, changed circumstances and population migration trends. 68% of New Jersey households have no children younger than 18 and 60% of New Jersey households have only 1 or 2 people. As a result there is less focus on schools, retail aimed at youth, etc. and more emphasis on convenience. The emergence of smaller households is also bad news for sellers of larger homes. In addition, the population migration trends are toward New York City. Urban type living seems to be the emerging preferred model where amenities are close by and cars may be optional. Also, New York City is creating jobs at double the pace than all of New Jersey and current trends point to living close by where the jobs are. Currently, 350,000 New Jersey residents commute to New York City for work so it’s no wonder migration in the state is moving closer to New York. In addition, historically, the zoning laws and regulations in New Jersey have made it all but impossible for younger households to gain a foothold in home ownership in many parts of the state. It follows, therefore, that young people in the so-called Millennial Generation are fleeing New Jersey in record numbers. The decrease in home ownership is also tied to the fact that the US government, for the first time ever, has ceased to be a major cheerleader for “The American Dream” of owning a home. Starting in 2008, the government released reports hinting that renting may be the dominant future paradigm. Trends in that direction have increased in subsequent years. Any future increase in mortgage rates will certainly not help this situation. The following chart shows the decrease in buying power resulting from only a 1/2% rise in interest rates for two different price ranges. It’s substantial and makes a good case for not waiting any longer to buy. The following chart does show improvement in what’s known as the ‘absorption rate’, that is, the amount of time (expressed in months) it will take to sell off the housing inventory currently available. You can see the improvement since 2011. Most of New Jersey is currently enjoying a low absorption rate with certain counties in the south of the state remaining stubbornly slow. It’s not surprising that these southern New Jersey regions have some of the highest unemployment rates state-wide. 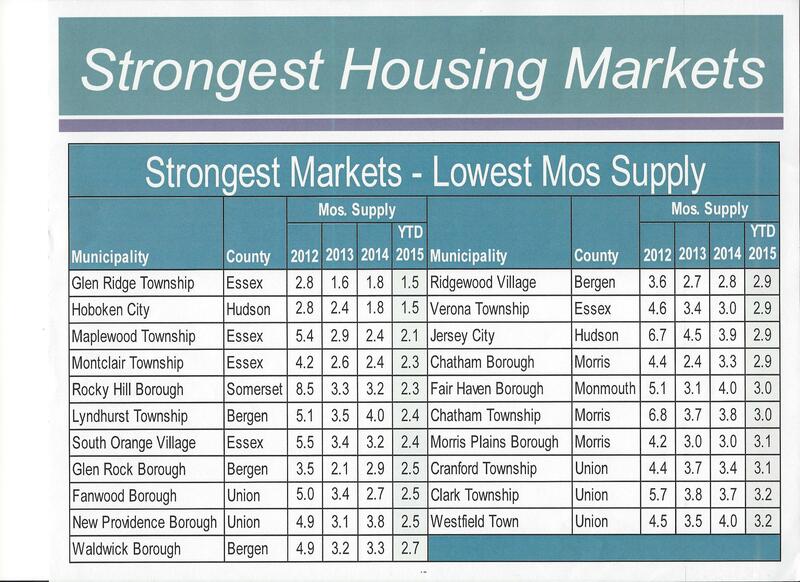 The following chart shows the strongest markets in New Jersey as expressed in lowest absorption rates. Remember, there are 565 municipalities in the state and each is its own market. You’ll notice that Montclair and Glen Ridge are strong markets with 2.3 and 1.5 months of supply, respectively. As for the future, Mr. Ottteau says that migration to the “inner ring” areas close to urban living will continue, home prices will remain strong in 2016 with annual appreciation approaching 4%. He sees interest rates rising in 2017 with price gains slowing. We are up against 2 cycles in the projections for the next couple of years. We are due for another slow down in home prices and activity as we approach the end of a positive 5-6 year housing cycle, just as has been the case for the past 50 years with the exception of the 10 year cycle from 1996 to 2006. In addition, the next recession is coming in a couple of years. Mr. Otteau contends that since New Jersey housing prices are down 16% currently, the next slow down in the economy probably won’t effect housing prices to any great extent. 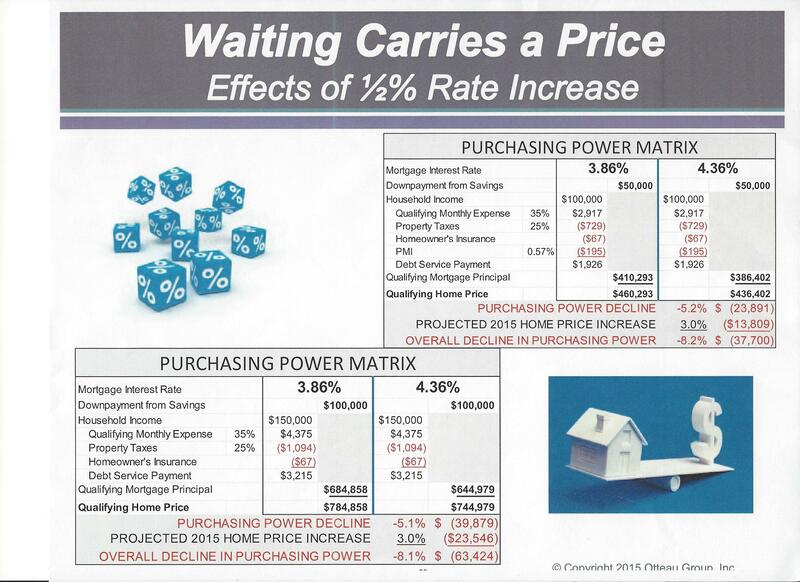 Finally, here is Mr. Otteau’s home price forecast. You will notice that a home bought in 2005 for $331,000 will regain its value in 2023. The chart shows the level of appreciation and depreciation of prices for the years 2000 to 2023. Keep in mind these are averages and may not pertain to every property in every town. Having seen past versions of this chart where the recovery year was sooner, I asked Mr. Otteau why the time period to recover the equity in the sample house keeps moving further down the road. He responded that New Jersey’s continuing poor economic and job performance pushes that recovery year further afield. The conclusion to reach from this analysis is that there is improvement in the New Jersey housing market overall with some pockets of the state doing better than others. Mr. Otteau makes the point that, in some higher price ranges, sellers have become too ambitious with their asking price in contrast to the trends we’ve seen and that has stumbled some segments. It’s natural to perceive a more robust market and want to benefit from it. I have always, always counseled caution to sellers and have asked them to base their expectations on facts, not emotions or impressions. We are no longer in the boom times, even in the best markets. Value, then, was calculated and perceived in a more cavalier way. Now, value is computed in the mind of the buyer, the lender and the appraiser in a more realistic fashion. Buyers should take heed of the future in their purchase timing. Mortgage rates are at historic lows now but will soon be higher and purchasing power will decrease as a result. If it’s right for you to buy now you should consider if circumstances will still fit your needs in the near future. I always say you should enter the housing market, buyer or seller, when it’s right for your life. Hopefully, this analysis will assist in that decision.